Being able to keep track of all the AWS cloud spending habits and understanding if you’re spending it right has been a pain point for most of AWS customers. An effective cloud cost management requires you to understand potential cost saving areas to stay fiscally prudent. Botmetric has paid attention to this and we have enhanced AWS Cost Management Analytics for our customers to keep them updated with their cloud spend. We understand that of all the cost saving tactics on AWS Cloud, one of the best ways to cut-short AWS cloud spending is through Reserved Instances. Hence, we now have a separate dedicated section in Reserved Instance planner. It has been completely revamped with an even more intuitive UI in place. All the recommendations have been improved with the most apt suggestions so as to help you make smart EC2 instance reservations. What’s more? You can now view recommendations and latest insights depicted in a beautiful pie-chart format! You can now view recommendations by ‘Instance Type’. With any EC2 reservation you can modify its Availability Zone(AZ), network type (VPC/EC2-classic) and change your instance reservation size to align with bigger or smaller running instances which aren’t reserved. If you feel that you aren’t going to use the reservation, then you can list your unused AWS EC2 reservations in the reserved instance marketplace. We are also working on analyzing your running instances and providing you with modification recommendations for the unused EC2 reservations. Very soon the Unused RI section on Botmetric will have a ‘view modification recommendations’ button for each of the unused EC2 reservations. Apart from all these, the latest enhancements in the Botmetric’s Cost Analytics for AWS cloud includes a few more striking features. Botmetric users can now get latest RI data on demand with just a click of a button. If you have rightly followed the recommendations and reserved instances, you need not wait for 24 hours before your RI data gets refreshed and you can verify. You can quickly initiate a refresh whenever you want. Botmetric alerts you with a notification when latest data is available. Generally fresh reservations gets activated only after an hour or two. Hence, we recommend you to wait for 2 hours before initiating the refresh after you have made any fresh reservations. The dashboard provides you with intelligent insights on the gross spend you would expect for the current month, to help you stay on track with your cloud spend. Botmetric smartly estimates your current month’s spend over your most recent data set and assists you with an appropriate insight on potential cost savings you can earn for that particular month. Estimation is subjected to vary based upon your actual cloud spends. The suggested gross estimated value will include a summary of your total month to date spend and forecasted value for the remaining days. Gone are the days when updating your cost data was limited to only one update a day. This has changed! With the new Cost Analytics on Botmetric, your data will get updated multiple times a day, based on the number of times AWS data is updated. So, you will always stay up-to-date with latest cost data. 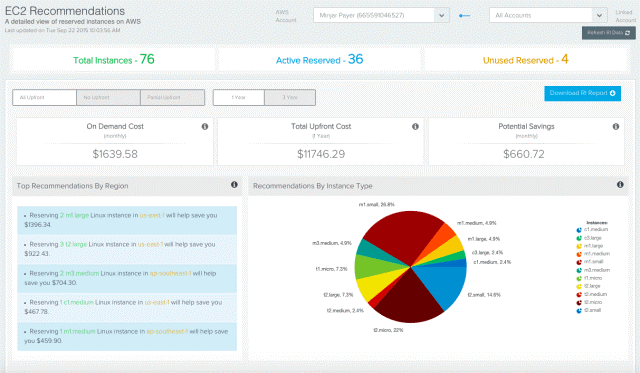 We believe that with these latest enhancements our customers cloud cost management experience will be enriched. Should you need any further assistance on understanding about AWS Cloud Cost Analytics, feel free to reach out to us. You can also write to support@botmetric.com. To stay updated on news and views regarding Botmetric, follow us on Twitter. As always, many of the features and updates in Botmetric are Customer driven. You can share your suggestions or feature requests here. Are you using AWS for your business and still not using Botmetric? Don’t wait up. Start optimizing your cloud infrastructure cost. Try Botmetric for free.